Check out this Catskee!! 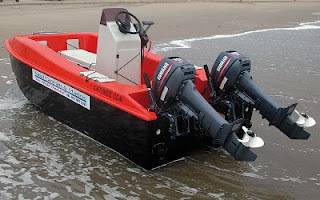 I recently came across this little boat on the web, and if you are anything like me you would be asking, "I wonder what that will be like to spearfish off??" 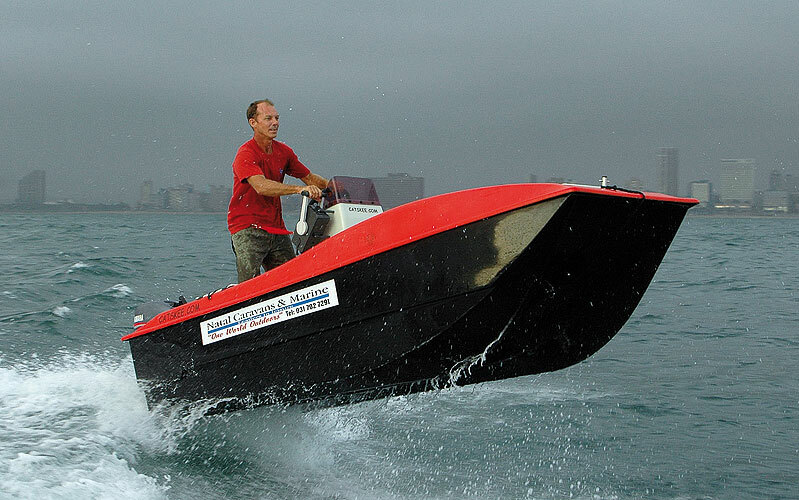 The 3.75m cat ski boat can use anything from a single 15hp, 2x 15hp... even 2x25hp - damn it must fly then!! Apparently the boat handles very well with 3 guys up powered by 2 x 15hp, this is pretty amazing considering that there is no other small, functional and seaworthy boat that can do this effectively. Catskee powered by 2x 15hp ...Imagine 2x 20hp 4strokes! I as checking their website Catskee.Com and they recon a complete boat is about R70k with 2x15hp Parsun outboards and on a breakneck trailer. That's not bad if you consider what other new boats will set you back. Put it this way next time I am down south I will definitely be popping and taking a closer look. The end of last week saw some of the best diving conditions we have seen this year. The vis was very good and the water temp was as high as 27deg. I dived between Umloti and Stud Rock on Friday and we absolutely smashed the Couta. They were mostly shoal fish but the occasional good one also came out. There were also fish further up the coast and most guys who dived got fish. Lloyd Hains 15kg Couta shot right in front of his house. On Saturday the conditions were good again, but with the word out that it was 'ON' every man and his dog was on it and I think the fish decided to disappear. I counted about 25 boats in the Westbrook to La Mercy stretch. Saturday was also a fairly 'bleak' day for me as I burst an eardrum!! There is nothing worse than diving down and and bubbles coming out your ear when you try and equilise. My heart instantly sank (and has not returned) as I knew that this meant that I was going to be out of the water for up to 6 weeks. Braidy setting up for the barrel. So here I am in the peak of diving season and ...high and dry!! But as the age old tradition goes, when you are high and dry .....you become the designated cameraman. My lighty is stoked ... probably because I can give him a lift to school and he can surf for an extra 30min in the morning. It is pretty cool watching him surf tho, I have been so busy away or diving that I have not watched him for a good few weeks. He had some crackers last night and this morning, even laying down a few good turns. Braidy looking comfortable and about to get pitted! Muir Robertson with a good sized Queenfish in the green water at Chideguele. I have just got back from a week away at Chideguele Mozambique. I went up to film and take pics for the HookedUp guys who were taking part in the 'Top 20' fishingski competition up there. Chideguele is an amazing place there is a huge reef structure consisting of 3 main ledges that run for over 50 km. The closest ledge starts on the beach near the lighthouse and angles out to sea until it gets to about 4km off shore. The next ledge mainly runs between 10-18m and is only a few hundred meters off shore at the light house but was already almost 2km off shore where we were staying 10 km further up. The next ledge is amazing and is generally around the 20m mark and drops off to the mid 30's in most places. In some areas the two ledges are close and you get drop offs that go from the shallow 20's to almost 40m!! Chideguele is about 50km north of Xai-Xai on the EN1 .. you cant miss it. Chideguele unfortunately is plagued with green water, the same green algae & plankton rich water that Guninjata and Zavora suffer. 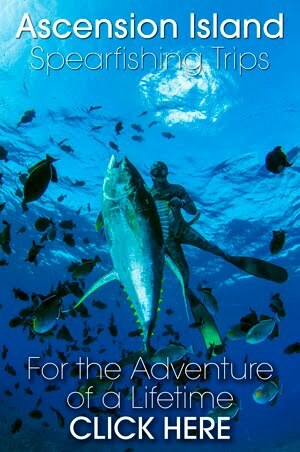 It is however the right stuff the fish like and generally the fishing is unbelievable. The one fish in particular that likes this area is our old friend the Couta. I even saw a lodge called Sera .. Portuguese for Couta. We paddled our asses off for a week trying to work out the spot. And because the comp was a species comp we couldn't just go and wind the Couta on the deep ledges. So we landed up shallow ..then deep ...then on that end of the reef and..... then on the other. I had my dive gear with for when I need to film the guys landing the fish from the water, unfortunately the vis was so bad this did not happen alot. I did manage to sneak a quick dive the one day when the vis was around 4-6m ... not the best when a couple km off shore. I managed a Couta of 13kg, but being ace out it was not the most pleasant experience. The view from Casa Demar the lodge we stayed in. Out side of the green water the place is pretty cool, there are loads of waves to surf and beach is very picturesque. We stayed about half way up the reef at Casa Demar, which gave the guys access to the reefs 10km to either side. On the first 2 days the swell was big and the inside ledges were breaking a km out. A couple guys got smashed and lost a fair amount of gear when they got caught inside by the rouge sets. Walley with just another Chidenguele Couta. On the bright side I bumped into a South African chap who is commercial fishing there. 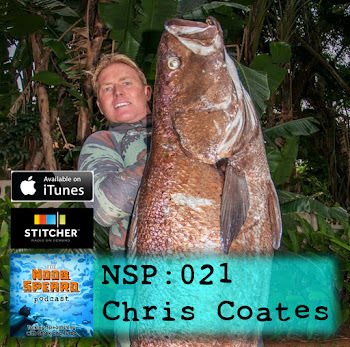 He had some really interesting insight that might fair well for us spearfisherman. There is another ledge that runs even deeper about 16km off shore at the close side. He said it is almost always clean there and it comes up to 30m from out of 47m water. 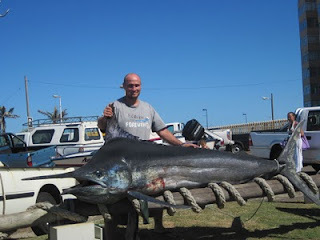 They often ... most days catch 20kg plus Couta there and he has gotten fish over 40kg. On hearing this I went on a mission to get more info and some marks. Unfortunately through a comedy of errors, I got left behind at the lodge he was staying at and then proceeded to get horribly lost walking back to Casa Demar. My walk about took 3 hours the last hour in the pitch black of night. All I could hear was the sea as a reference so made for the beach and eventually made it back to the lodge. By then I had missed dinner and after a day paddling the ocean I was beat, so as you can well imagine there was very little comedy when I got back. The upside is I have the marks and next opportunity I get I am seriously think about getting out to the deep marks off Chideguele, I think the place could be the spot to break that 30kg Couta mark. Conrad Nelson enjoying the fine conditions. The conditions the last few weeks have been really odd. Sure summer has prevailing onshore winds from the north east, but we have had only a day and a half of southerlies in more that 40 days! The sea has gotten cold and has mostly had a 'lovely' pea green tinge to it. All this right smack bang when we should be climbing into the Couta in 25- 27 degree summer water. I have been keeping myself busy taking pics of surfing and catching a few waves in between. After taking some good pics, I grabbed a paddle board and got a few waves for myself. While at the back I noticed a spearo swimming in with some Couta. I paddle across to him and he had 4 or 5 good fish. That was it ... I packed up went home had a fat chow, and jumped into bed to recover from swimming for 3 hours and then paddling for another few. By the time I woke up packed my dive gear and swam all the way to the drop off it was 5pm and there were some mates already swimming back in. The water had gotten cold again and they said that it was dead. I was there and thought lets just try ..who knows what will swim passed. Anyway I hit a luck and got 2 Couta , one was a good fish of 18kg! The guys who I passed wernt to impressed after not seeing anything for a few hours, I guess I was just lucky. The sea is still clean-ish with a strange south north current that pushes when the north east backs off. There is Southerly predicted on Wednesday maybe that will bring the warm water.